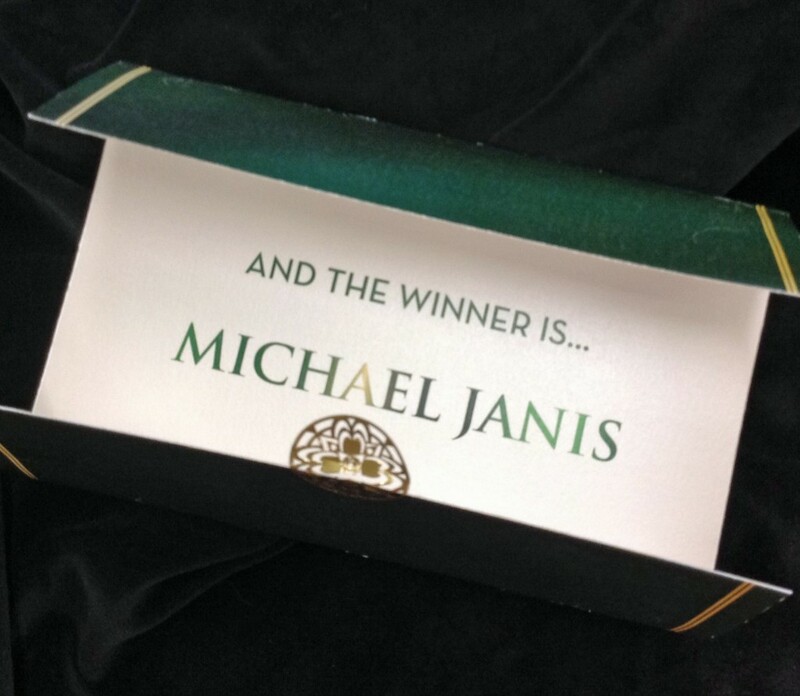 WGS’ Michael Janis Wins DC Mayor’s Arts Award! 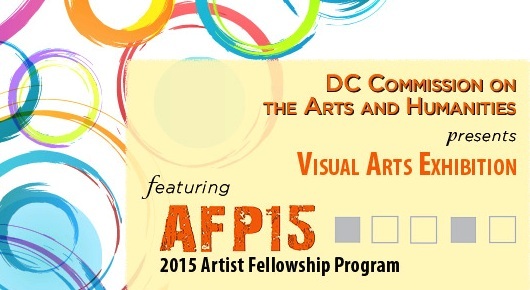 DC Mayor’s Arts Awards are presented in a similar manner to Hollywood’s Academy Awards. 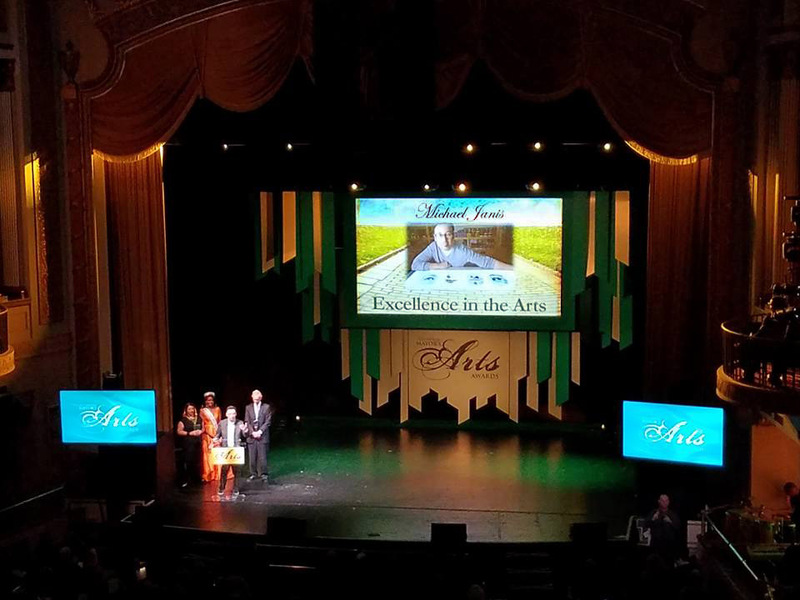 The Mayor’s Arts Awards are the most prestigious honors conferred by the city of Washington, D.C. on artists, teachers, nonprofit organizations and patrons of the arts and humanities. 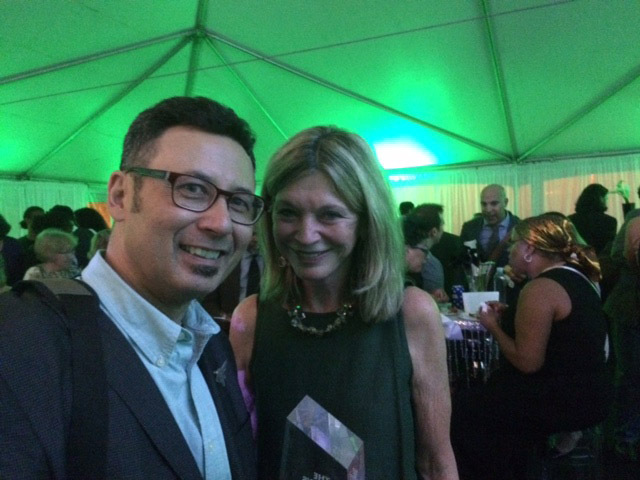 D.C.’s 31st Annual Awards ceremony was held at the Historic Lincoln Theater this past Thursday, and Washington Glass School Co-Director Michael Janis was awarded the “Excellence in the Arts” honor! 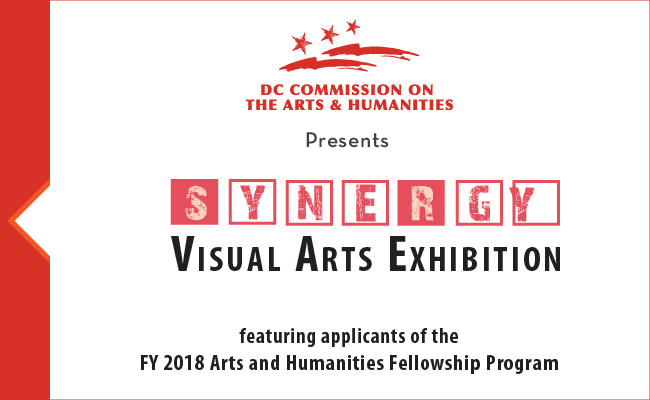 The DC Commission on the Arts & Humanities works hard at supporting and advancing the arts, humanities and creative industries and presented the awards as recognition of how the creative community impacts the District. 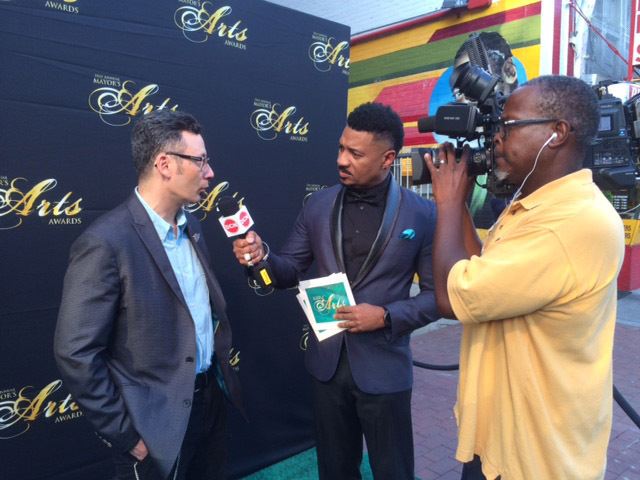 Michael Janis interviewed at the Lincoln Theatre. 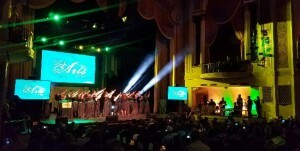 The Awards Gala – modeled after Hollywood’s Academy Awards – had it all – the red carpet (but in green), media and press interviews, glamor, gowns, glitter. DC Mayor Muriel Bowser welcomes the audience to the 31st Mayors Arts Awards. 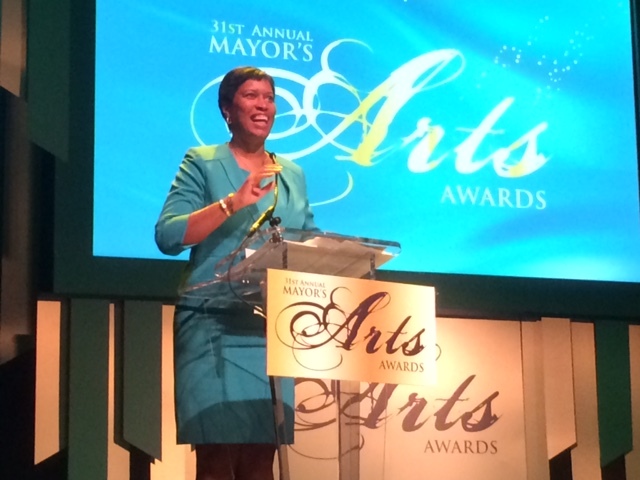 Mayor Muriel Bowser welcomed the audience to the award ceremony and some incredible performances were throughout the evening’s ceremony. 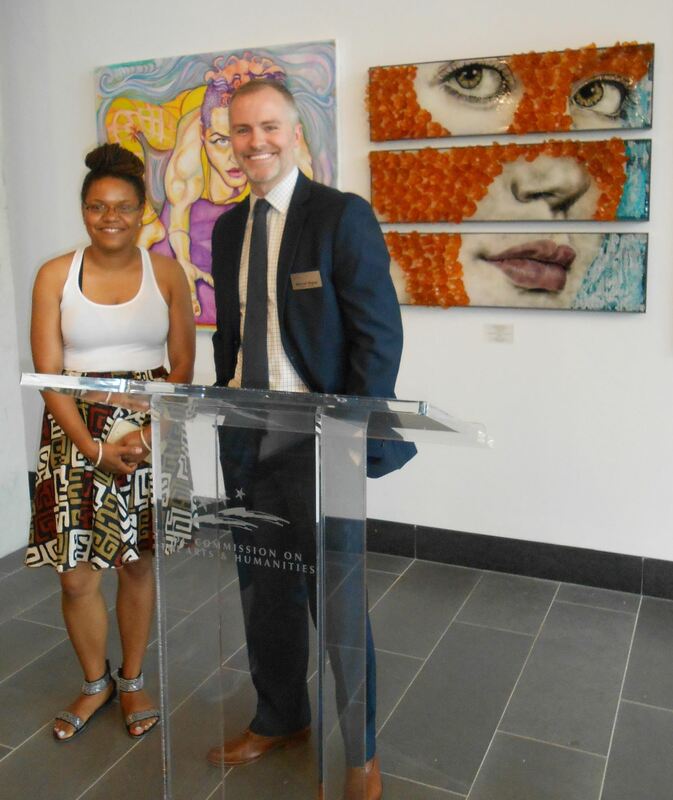 In addition to Michael Janis winning the Excellence in the Arts, the winners included Once Common Unity for Excellence in Creative Industries, Leron Boyd for Outstanding Student, Dawn Johnson for Excellence in Teaching and Tara Campbell for Outstanding New Artist. 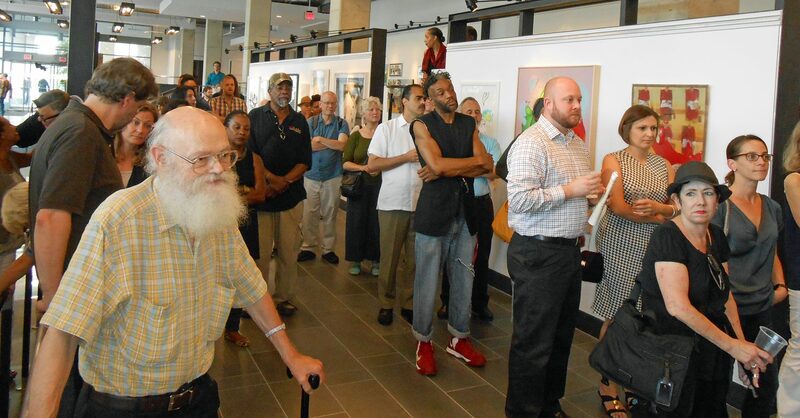 The DCCAH also presented three honors – Lou Stovall, for Lifetime Achievement, Julianne Brienza for Visionary Leadership and E. Ethelbert Miller for Distinguished Honor. Washington Performing Arts, Children of the Gospel Choir performed. 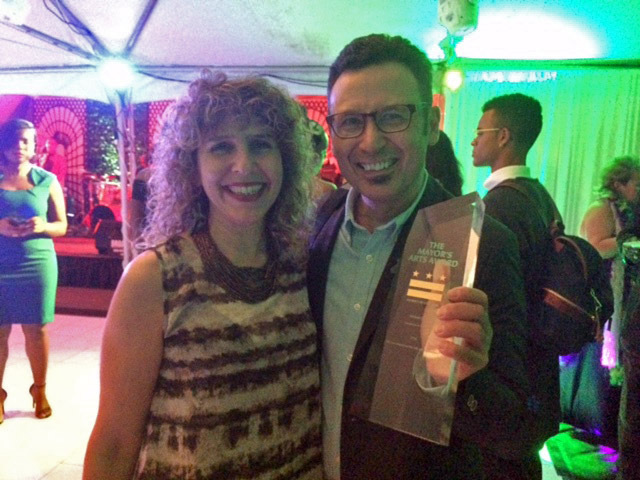 Congratulations on the Award Michael! What will you be doing next? 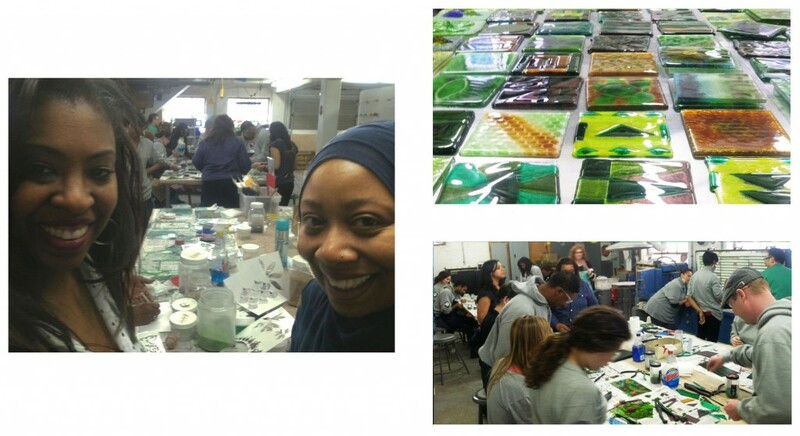 Most of you know about the Washington Glass School’s extensive glass classes and the artwork, but many of you don’t know the third component of the Washington Glass Studio. 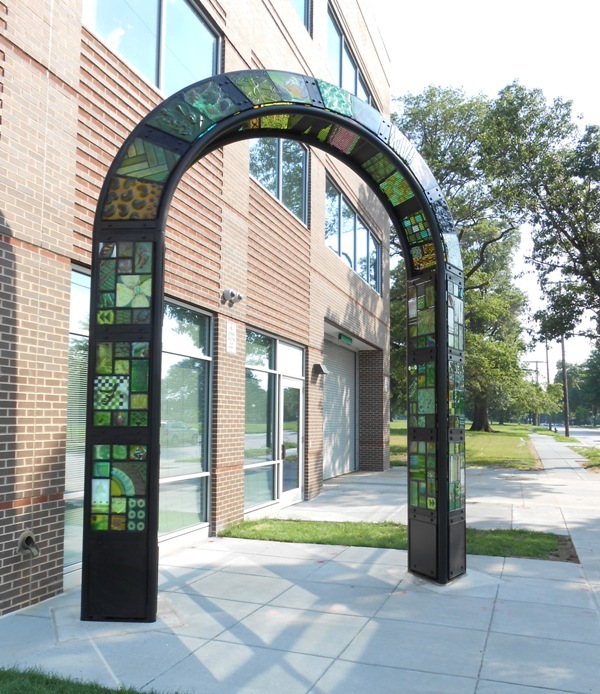 The Washington Glass Studio was established in 2001 to deliver artwork to the public realm by creating site specific art for architectural and landscape environments. 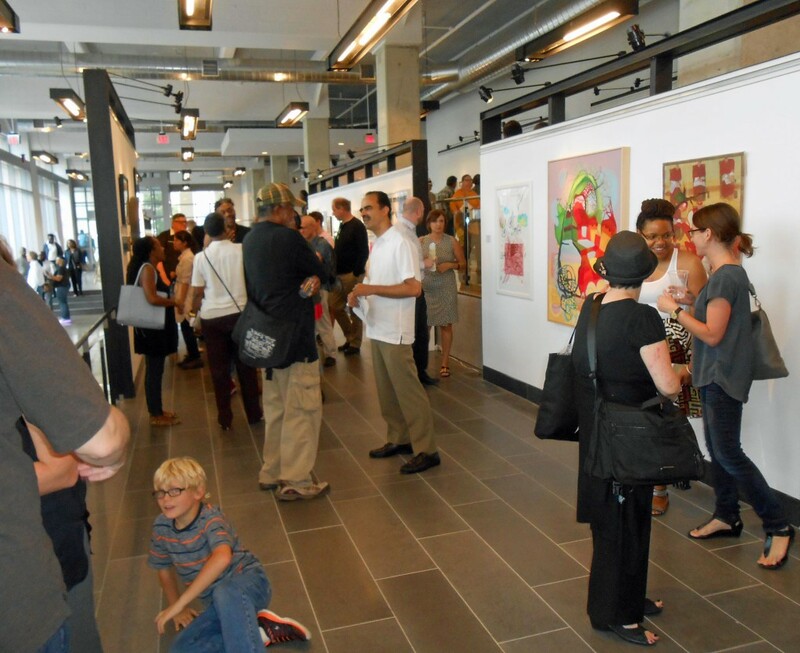 Here is a highlight of a few recent projects to give a scope of what we are capable of producing. 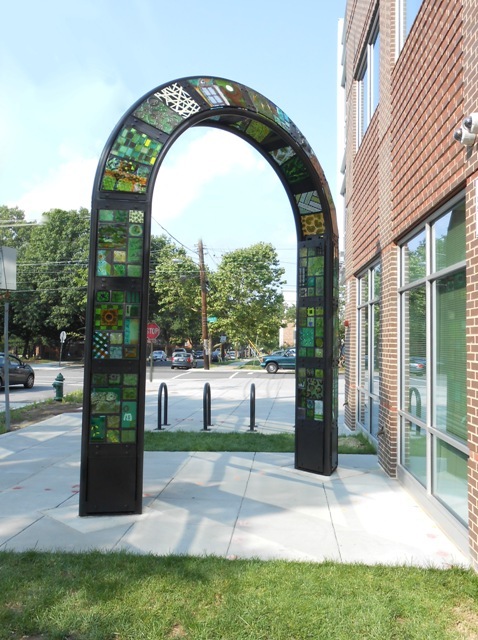 We are currently finishing a commissioned public art sculpture in Washington, DC’s Ward 7 - in front of the Unity Parkside Health Clinic and across the street from Caesar Chavez High School. 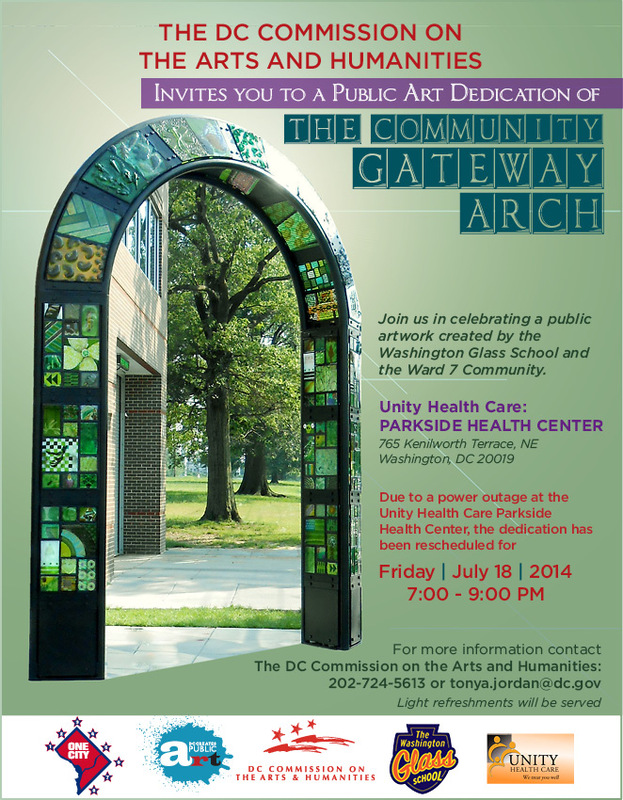 This sculpture will be one of the first public art projects in Ward 7. 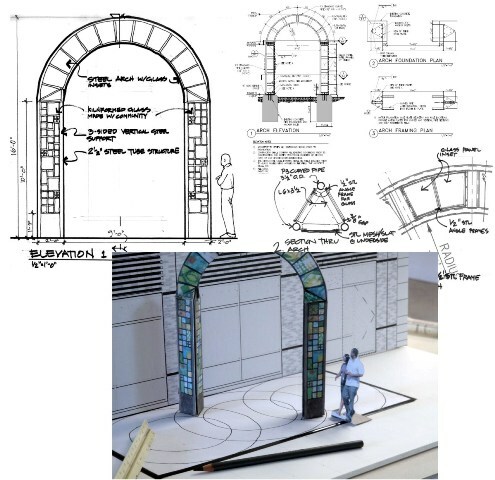 Consisting of a 16 foot high tri-sided glass covered arch, the entire concept was derived from meeting with the community in the Kenilworth neighborhood. 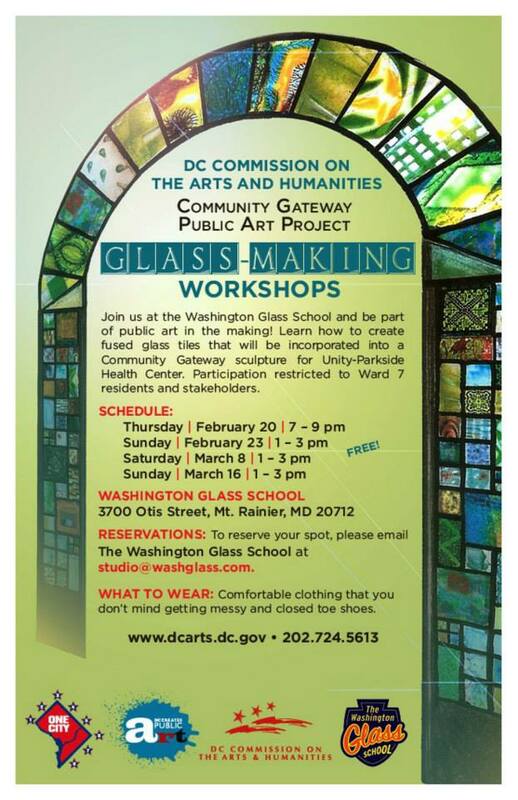 The residents of the community participated in the creation of the glass elements for the public artwork sculpture. Made up from steel tube sections the steel framework is clad in covered in colorful kilncast glass panels bolted to the structure. Over 300 tiles were required to complete the structure. 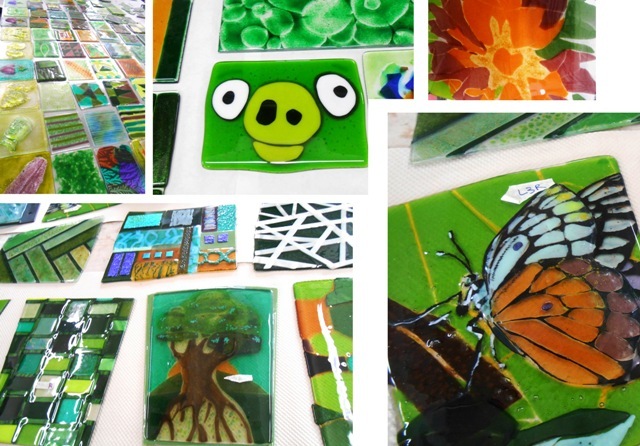 These 300 tiles we all hand made by volunteers in the community surrounding the arch. The artwork will be internally illuminated with LED lighting throughout the sculpture. 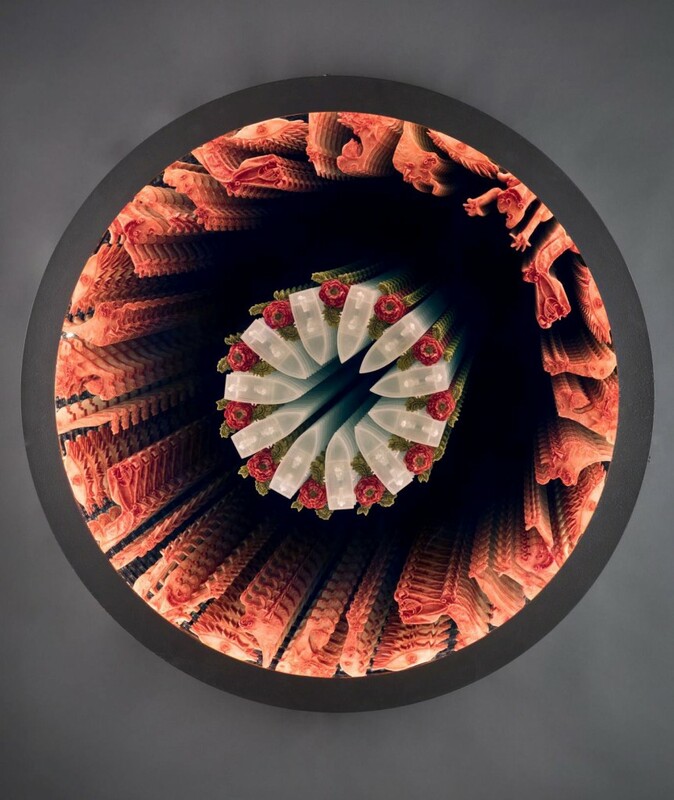 Installation is set for end of May/early June. The Architect of the Capitol provides design direction for the historic Library of Congress Adams Building. 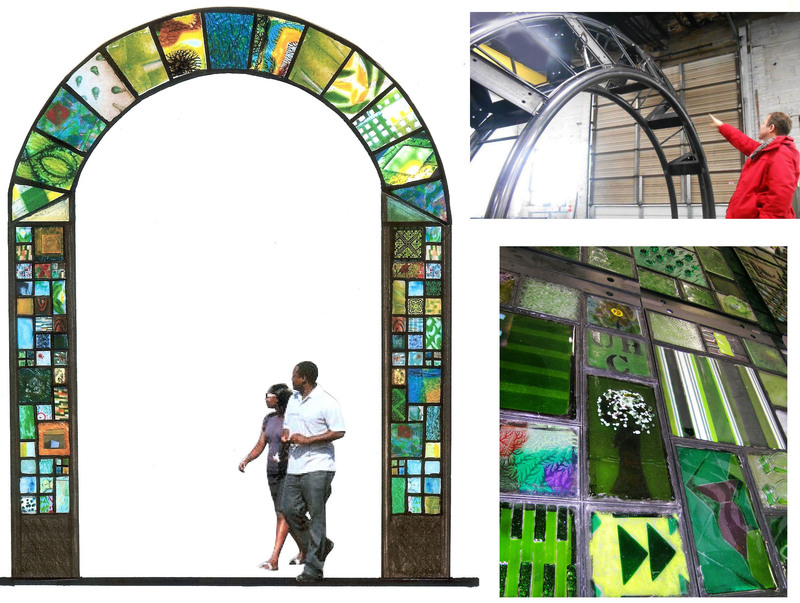 Of our recent public art works, the most acclaimed is our cast glass doors for the Library of Congress’ Adams Building. 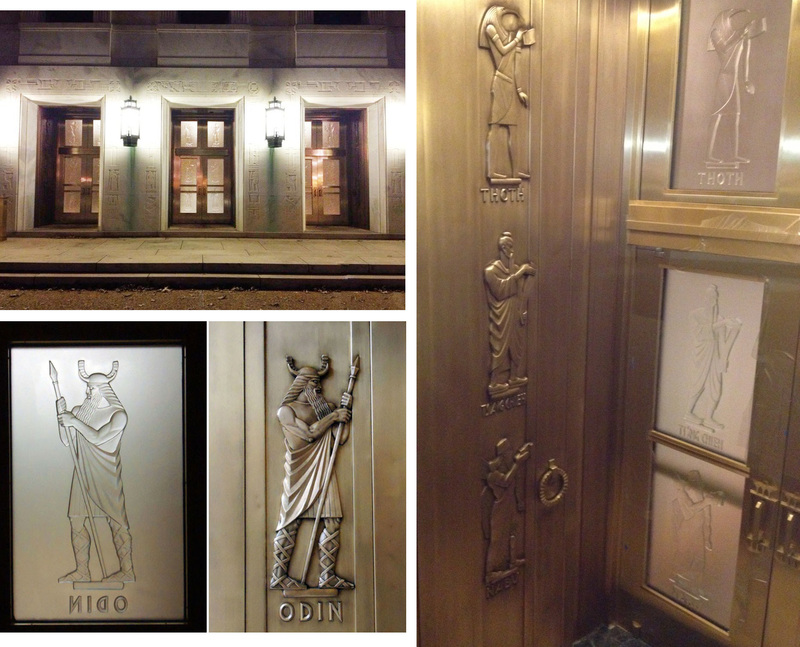 The original doors were cast bronze from the early WPA days. 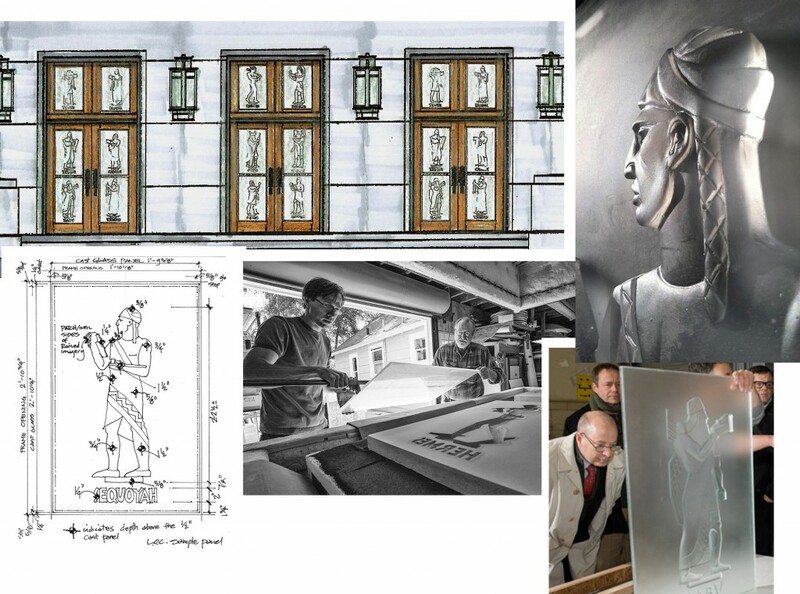 They were designed by Lee Lawrie, who is most known for his designs at Rockefeller Center in NYC. The original bronze bas-relief doors had ceased to be functional years ago, and the entrances were not up to current safety and security code. In a moment of courage and insight, one of the architects of the Architect Of The Capital’s office realized that if the bronze doors were redesigned with glass replicas of the original bronze bas-relief, then he could bring them up to code and increase safety, for much less money. We then took on this multi-year project, with spectacular results. 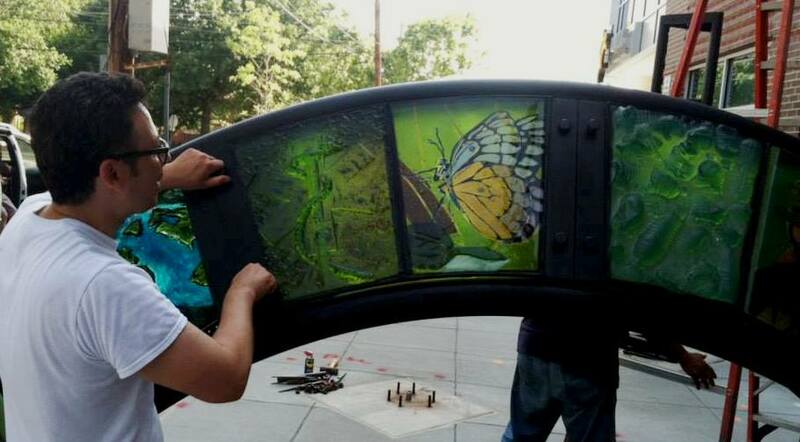 There were 6 sets of these doors, facing the east and west sides of the Adams Building. 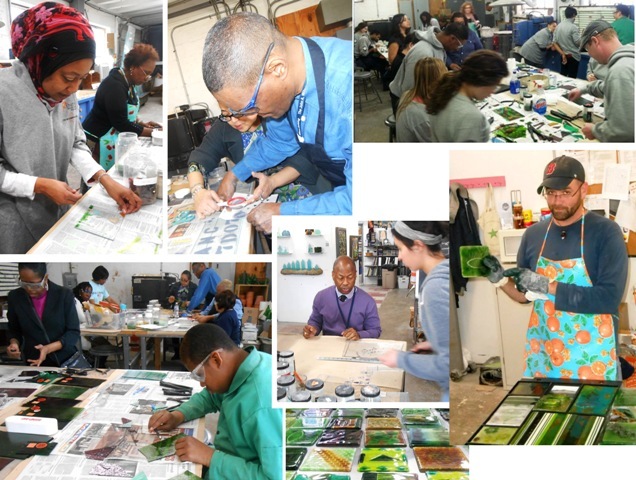 American Craft Magazine did a feature story on our work for the Library of Congress and its process – click here to jump to the magazine’s article online. 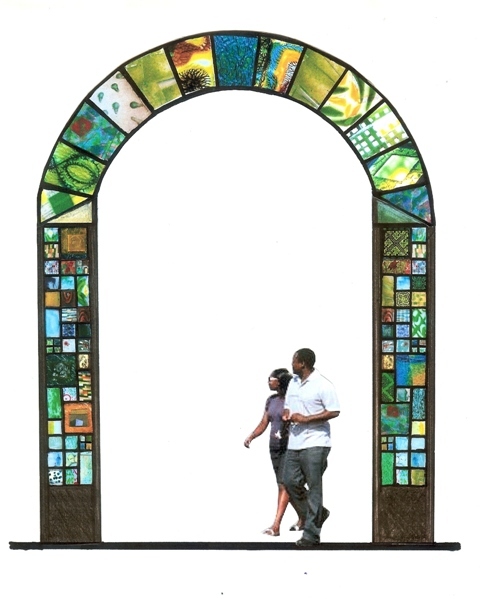 A smaller scale work was created for the charity organization “Food and Friends” new outdoor park. 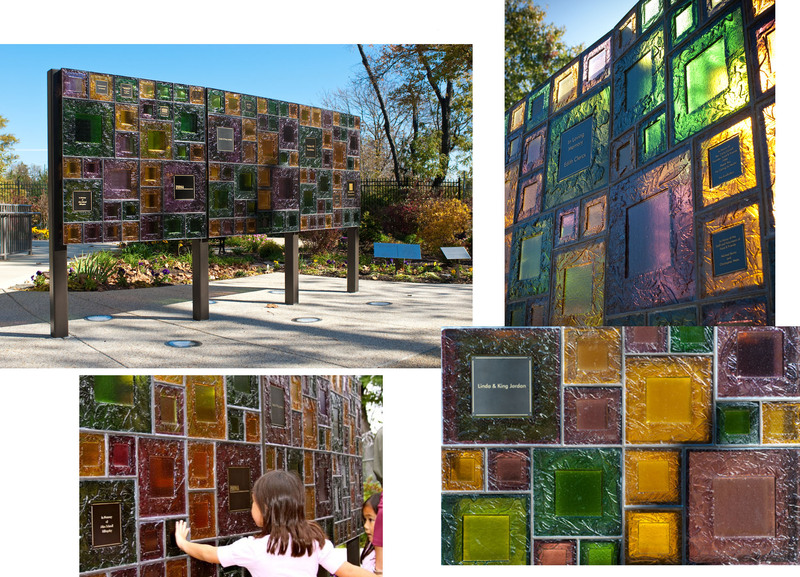 We made a cast glass Donor Wall that was to honor those who have passed away, to support to charitable work of the organization and to encourage donors to participate. Bas-relief cast glass panels in complementary colors set into a steel framework allows light to pass thru the memorial wall and create colors and patterns on the surrounding plaza. 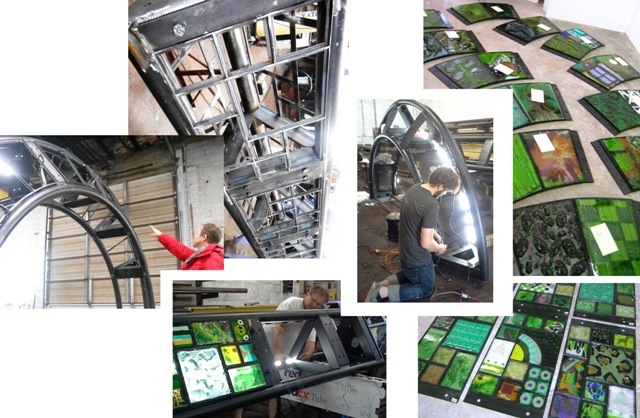 The nature of the glass panels encourages tactile investigation and contemplative interaction. 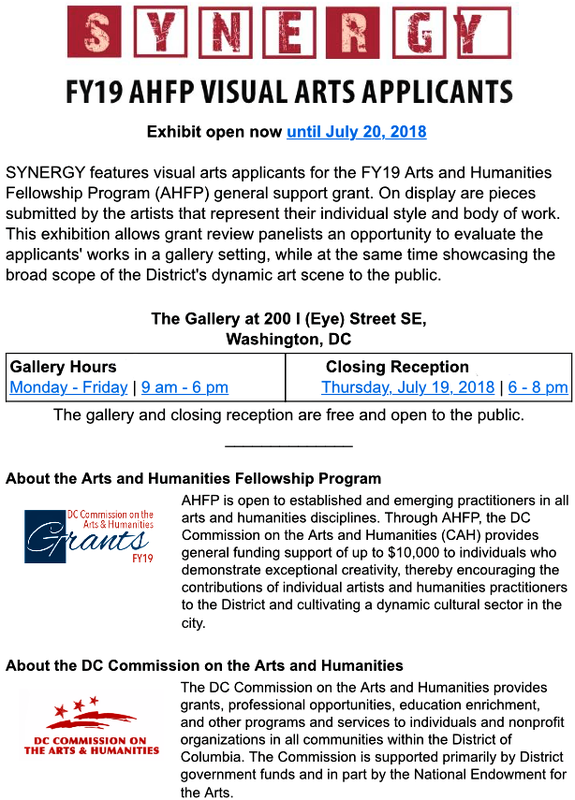 Food and Friends organization commissioned an outdoor donor wall for their park alongside the charity’s Washington, DC facility. 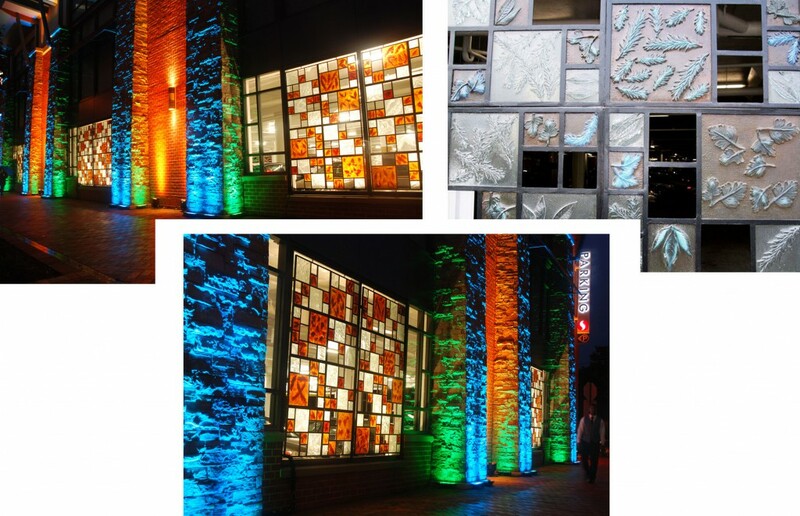 Glass recycled from the original site’s building was incorporated into Safeway supermarket’s first LEED certified building in Montgomery County, MD. This is only a fraction of what we have competed and what we are capable of doing. No job is too large or too complex. 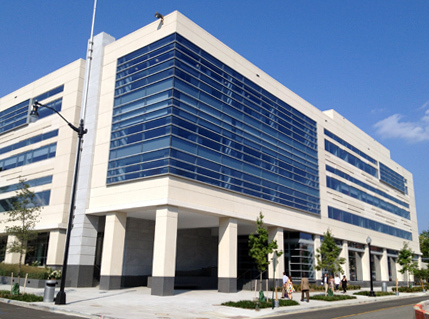 Our architectural design and technical team work well with architects and designers. 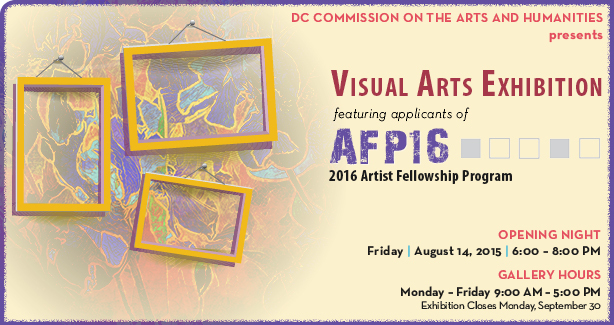 We are currently looking for additional projects, so let us know in case you know of any, or know someone who might!